Chanteur Country US né le 27 Janvier 1968 à Atlanta (Texas). In May 1991, just prior to the scheduled release of Lawrence's debut album, he was walking a girlfriend back to her hotel room when the two were mugged by several gun-wielding attackers. Lawrence fought back to allow his companion time to escape and was shot four times; two bullets only grazed him, but one had to be surgically removed from his knee, and the other remained deeply embedded in his pelvis. Fortunately, he progressed rapidly through physical therapy, and the album, Sticks and Stones, was released later in the year when Lawrence could return to promotional duties. Its lead single, the title track, went all the way to number one on the country charts, helped out by all the publicity. More hits followed in the Top Tens "Runnin' Behind," "Today's Lonely Fool," and "Somebody Paints the Wall," and Lawrence was on his way to stardom. He arrived there with Alibis, the platinum-selling 1993 follow-up that produced an astounding four chart-topping singles: the title track, "Can't Break It to My Heart," "My Second Home," and "If the Good Die Young." In 1994, Lawrence contributed the Top Ten hit "Renegades, Rebels and Rogues" to the soundtrack of the movie version of Maverick and also released his third album, I See It Now. "Texas Tornado" became his sixth number one hit, and three more singles — the title track, "As Any Fool Can See," and "If the World Had a Front Porch" — all went to number two. Somewhat lost in all the success was Lawrence's arrest that same year on a weapons charge, but it didn't slow his career momentum at all. He tossed off the Live and Unplugged set in 1995, which compiled acoustic tracks and concert performances with his backing band, Little Elvis. In 1996, he returned with the proper follow-up album Time Marches On. The title track was a huge hit, topping the country charts, and "If You Love Me," "Stars Over Texas," and "Is That a Tear" all went Top Five. His hit streak continued with 1997's The Coast Is Clear, which contained two more Top Five singles in the title track and "Better Man, Better Off." However, all was not well behind the scenes. In January 1998, Lawrence was convicted on charges stemming from an incident in which his wife accused him of hitting and threatening her; the couple soon divorced. Lawrence laid low for a while, putting his life back together, and returned in 2000 with the uneven but highly personal Lessons Learned. The title track was a Top Five smash, but it was the only major hit from the record, and Lawrence soon parted ways with Atlantic. 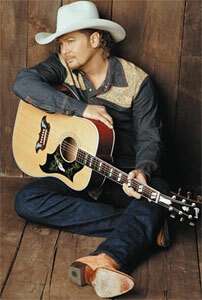 He subsequently signed with Warner Brothers and debuted for them in 2001 with an album titled simply Tracy Lawrence. Despite some good reviews, it failed to halt his downward commercial momentum. Lawrence released the studio album Strong in 2004 and a greatest-hits set through Dreamworks Nashville a year later. For the Love arrived in the early 2007 on Lawrence's own label, Rocky Comfort Records. Two years later in 2009 the singer was crossing over to the Christian music market with the album The Rock and its lead single "Up to Him." 2008 CD ROCKY COMFORT ? (US) . 2008 CD Def Cowboy ? (US) .